Asuka has made her decision, and she has elected to challenge Charlotte Flair for the Smackdown Women’s Championship at Wrestlemania 34. 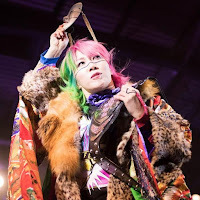 Asuka, who earned a title shot by winning the first-ever women's Royal Rumble match back in January, confronted Flair in the ring after her title defense over Ruby Riott at tonight's WWE Fastlane pay-per-view. Asuka hit the ring immediately after the match and got right in the champion’s face, and simply pointed to the Wrestlemania sign to confirm her decision. Charlotte looks a bit concerned at first, but then she smiles and points at Asuka before looking up toward the Mania banner.